Here's a recipe for Cait, because she loves pineapples so much. It's as simple as it is delicious. You just throw it all together and pop it in the oven. It just doesn't get any easier than that! 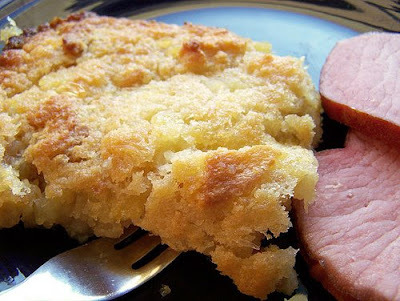 It's absolutely the quintessential side dish for a holiday ham and it's perfect for any occasion! If you're not a fan of ham, try it with chicken or pork! It goes well with everything! It's seriously one of my all time favorite dishes in the whole wide world. If you've never tried it, you simply MUST! Hope you like it, Cait!!!! Preheat oven to 350F. Grease a 9x13 baking pan. In a mixing bowl, cream butter and sugar. Beat in the eggs one at a time. Using a large spoon, fold in the pineapple and bread cubes. Pour into prepared pan and place it in the oven. Bake for one hour. Let sit a few minutes to firm up before serving. - You can cut the amount of sugar by half if you'd prefer a stuffing that isn't quite as sweet. It'll still be delicious. - For a little extra spice, add a sprinkling of cinnamon or pumpkin pie spice over the top before baking. - You can easily substitute pineapple chunks for half or all of the crushed pineapple. - To avoid excessive browning, cover the casserole with foil for the first half hour, then remove the foil and bake it uncovered for the remaining half hour. - This recipe serves 8-10, but the amounts can easily be cut in half if you're serving a smaller group of people. The baking directions remain the same.